I'm working on a Saas platform that will provide its user with an SDK for their apps. Users will either be able to create multiple apps (tier 1) in their account or only one (tier 2). 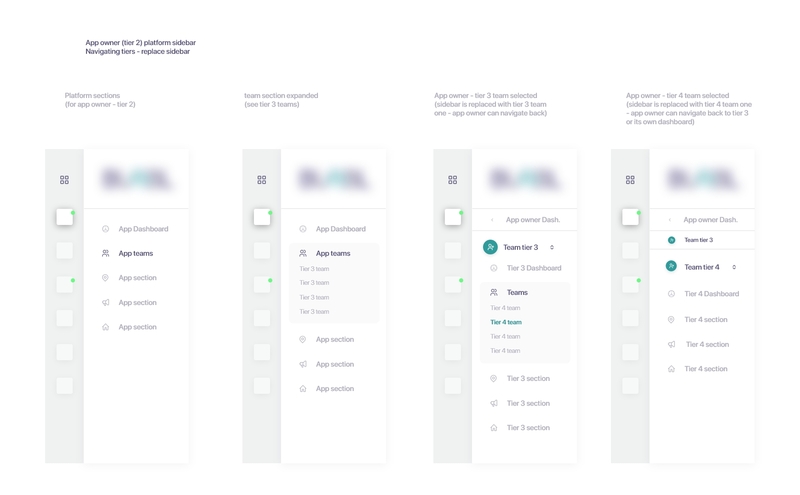 Within each app, the admin user (app owner) will have the ability to onboard teams (tier 3); these teams will also be able to create teams (tier 4). Every tier sits lower in the architecture and will have limited permissions. Each tier will have its own dashboard, with several sections. Users in the same tiers cannot see each other content/dashboards, neither of upper tiers, but can navigate through lower tiers (mostly for monitoring of use and troubleshooting). I'm having issues identifying good practices when building navigation for such nested layers. Imagining to be the owner of multiple apps, and wanting to dig deeper into the lower tiers, how should the navigation behave? 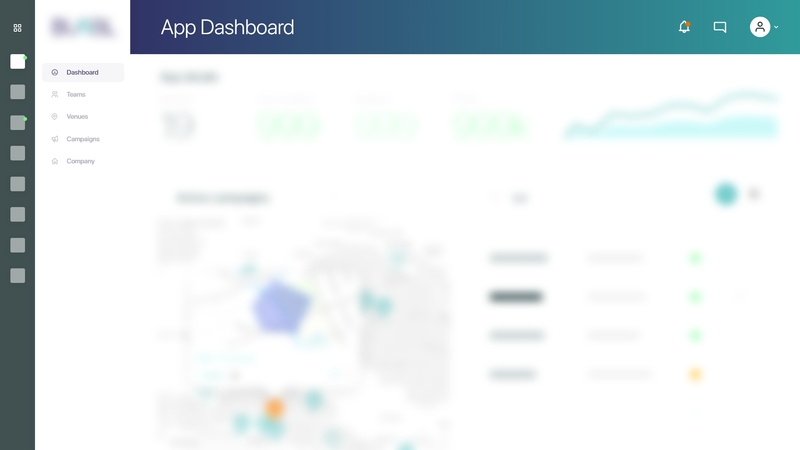 The problem to me is designing the navigation WITHIN each app, from the app owner's dashboard down to the tier 4 teams' dashboards. The navigation sidebar is necessary for the admin user to navigate through -and back to- his dashboard/account, but when moving below to tier 3, it should also show the sidebar relevant to that tier in order to access each tier's content/sections. Can you see any major issue with this solution? 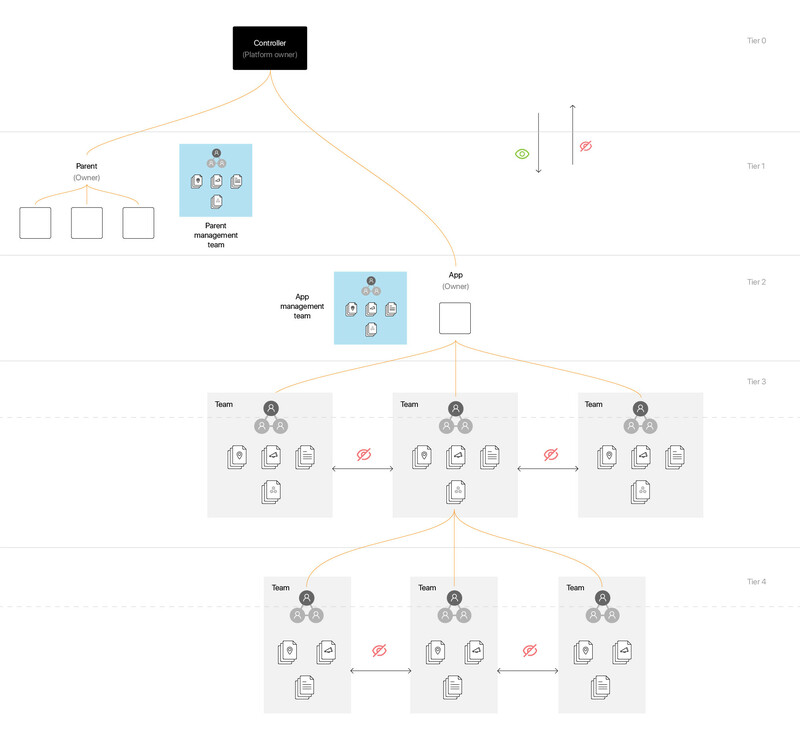 Can you point me towards the keywords/topic in question (SaaS admin navigation through multi-tiers architecture?) Recommendations/best practices? Examples of existing SaaS platform that I could check out? It is quite a convoluted architecture and I hope the initial description will be enough clear. I would use the breadcrumb option and always have it on "top" and also following as you scroll down. Because you can always see how "deep down" while you're scrolling through the project and you can quicker go back to a higher level. Not the answer you're looking for? Browse other questions tagged navigation design-patterns sidebar administration or ask your own question. What's the best position for the global navigation of an application within an intranet site that has its own global navigation? Are navigationbars fading into sidebars? What's the best way to keep all section headers visible in a long collapsible sidebar menu? IA Structures Similar to Salesforce? Are nested tabs acceptable on mobile?